Yesterday HTC announced the Desire 320, a handset that’s so strikingly similar to its predecessor that you can hardly call it an upgrade. Luckily, the Taiwanese manufacturer quickly redeemed itself by announcing a much more impressive smartphone in the form of the HTC Desire 826. While labeled as being a mid-range entry into the series, this device is almost on the level of flagship smartphones when it comes to its specs. Moreover, this is also the first handset in the series to run on Android 5.0 Lollipop (with the Sense user interface on top) straight from the get-go. In short, the HTC Desire 826 does not disappoint. As you may or may not know, Android 5.0 Lollipop was built to support the 64-bit architecture, with Google even encouraging developers to create apps suitable for it. As such, HTC decided that it would be best to equip their latest offerings with 64-bit processors, which in this case is the Qualcomm Snapdragon 615 octa-core CPU clocked at 1.7 GHz, complete with 2 GB of RAM. 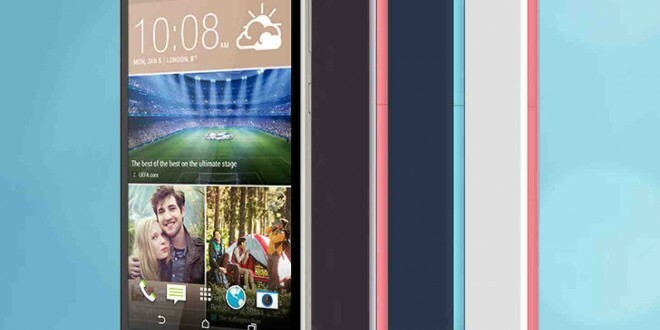 The HTC Desire 826 also sports a 5.5-inch display with 1080p resolution and a 13 MP camera on the back. Elsewhere, we can also find a 4MP secondary snapper on the front that makes good use of the company’s UltraPixel technology. Rounding up the specs of the HTC Desire 826, we have 16 GB of internal storage memory with microSD card support, and a 2,600 mAh battery. Finally, users of this device will also be able to enjoy features such as the HTC EYE Experience and HTC BoomSound. As for when interested customers can expect to get their hands on the HTC Desire 826, the company says that it will go on sale at some point later this month. HTC will initially launch the smartphone in their home country, with other Asian markets to follow soon after. There is currently no news regarding a possible release date. Likewise, the price has not been announced yet either.